Living here in this house–this house with an Awesome Porch and a Snuggle Couch and a Needy Cat, two of which have their own Twitter account–has been like attending a party I never have to leave. It’s just this constant dynamic state of motion and emotion, full of amazing and smart and beautiful people who add to the hilarity. We are all characters who enhance the plot–none of us are just along for the ride. It’s magic–this house is full of it–and it’s better when shared. I woke up laughing for the second day in a row this morning, remembering Kram and his faceplant into the street on Saturday night. The whole scene couldn’t have been pulled off better had it been choreographed–I honestly believe Chevy Chase Himself would have given the boy an award had he been present. It wasn’t just the fall, or that it happened in the middle of a serious conversation I was having with the Gypsy, it was that Kram tripped, fell, and just laid there in the street for what had to have been a full minute. There was silence as we all watched him. Kelli and I by the Alien Lesbian Cow fence, his friends from the sidewalk above him, and the house & contents of Awesome Porch. Bob slowly sauntered down the front walk, crossed the street to where Kram laid, and bent down. Kram got up, brushed himself off. “What do we say?” the Gypsy yelled at her son from the fence. Kram raised both hands to his audience. “It’s all good. I’m good. It’s all good.” And his adoring fans hooted and hollered as he walked off the field of play. There was so much more than that moment, though. There always is. There were pansteaks and pigtails and nail polish. There were stripey socks and toe socks and Twister. There were Ninja Turtles and Snuggie herpes. There was ice and rain and a trip to the adult store and another funeral. There were tummy aches and belly laughs and too much cuddling and not enough sleep. On the last day, there were cookies. That’s where the Gypsy caught the magic on camera. See the magic in the air? Qwee’s birthday was Thursday, and her favorite cookie in the whole world is a Greek pastry called koulourakia. And as any refugee princess worth her salt never flees without her recipe box, I decided to make them for her. I also decided it would be fun to have a little help from my friends. Personally, I prefer to think of it as magic. Fairy dust. Princess glitter. There’s nothing to say that’s not what it actually was. Awesome Porch is a magic place. Things happen here that don’t just happen everywhere. We’ve all come to accept that. The fun part is, those things still continue to surprise us. Because nobody expects the Spanish Inquisition. Nor do they expect bullhorns and flashing red lights at 8pm on a Sunday. The house was quite–the first time it had been quiet for weeks. Kelli had found The Philadelphia Story on AMC, heated up a bowl of leftover potatoes, and watched the movie with her eyes closed. I got comfy with a blanket & pillow on the floor. Kram sat on the other end of the couch, playing Mario but still commenting on the film. Lilwenchi sat in the rocking chair with a laptop and headphones, content in her own little world. Until the bullhorns and flashing red lights. “We’re surrounded!” yelled Kram, leaping to his feet. 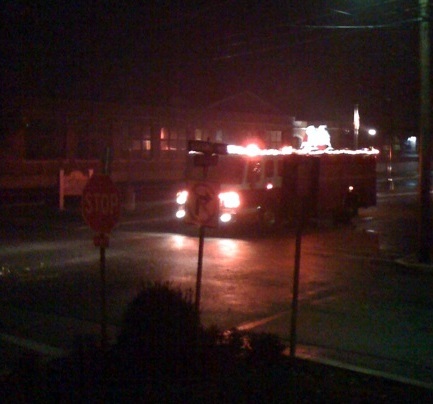 “What the hell?” said the Gypsy, and we all ran out onto the porch in time for the second fire truck to pass by, this one bearing a smiling and waving Mr. and Mrs. Claus. The bullhorn wished us a Merry Christmas. “Hi, Santa! Hi, Mrs. Claus! Merry Christmas!” The four of us jumped and yelled and waved and cheered. The fire truck paused in front of the house long enough to honk and run the siren for us, and the third truck did the same when it passed. The rest of the neighborhood stayed dark. We wondered if anyone else bothered to enjoy the impromptu parade. Not that it matters what anyone else thinks. Because we did. We don't need no stinkin' sleigh! Awesome Porch = still awesome. This entry was written by Princess Alethea and posted on December 14, 2009 at 1:23 pm and filed under awesome porch, Friends, life, pics. Bookmark the permalink. Follow any comments here with the RSS feed for this post. There is no such thing as too much cuddling!